‘Tis an ill wind that blows nobody any good’ goes the well known saying. This is, of course, totally true. Metaphorically speaking, you are indeed unfortunate if there are no positives in a set of initially negative circumstances. But it’s also true literally - especially if you are a tabloid headline writer. This winter in the UK, we’ve had not one but two visits from that illest of winds: the Beast from the East. Cue reports of end-of-the-world like apocalyptic outcomes - a veritable Snowmageddon - for the UK from the Daily Mail and the Daily Express. Of course, they are over-exaggerated nonsense, supported by supposed ‘experts’ who are nothing of the sort. But we lap them up. We click on the click-bait links. They get the revenue from us doing so. And the ill wind brings them plenty of good! But it’s not just tabloid headline writers who rub their hands with glee at the prospect of the Beast from the East. For, us landscape photographers also find ourselves wishing for the good that accompanies this dreadful draught. We, you see, long for ‘proper’ winter in the UK. Not just the drab, damp overcast stuff that just makes you long for summer. But cold brings frost and snow - and these two things can transform our landscape into the most photogenic of beauties. Whilst we too may be sceptical of the extremes of the tabloid headlines, deep down there’s a part of us wishing that they were even a wee bit true. And so, it was with great anticipation that we awaited the first visit of the Beast in February. 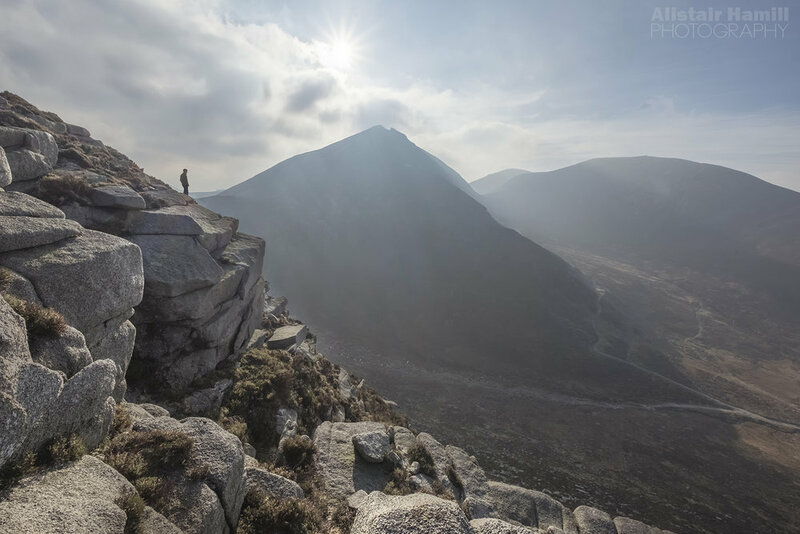 When first the winds swung round to the East, but before they had really taken hold, Ryan Simpson and myself headed for the Mournes. 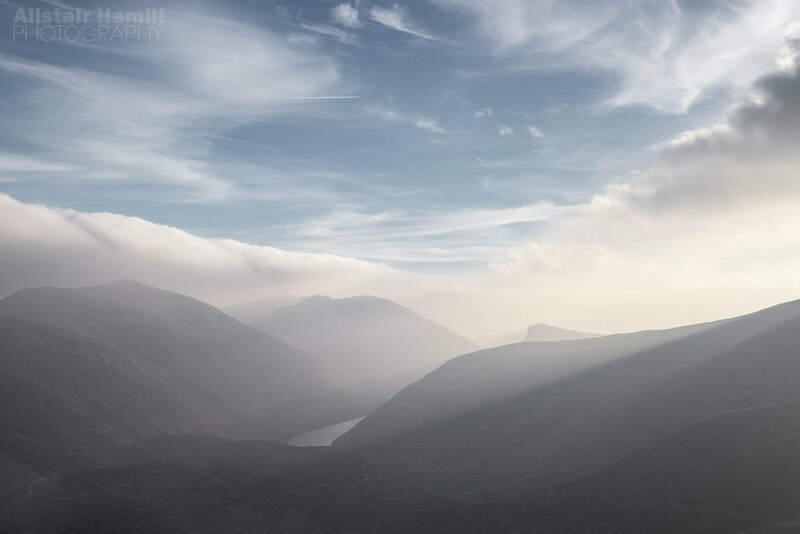 Placed as it is in the south east of our country, it’s one of the places that can benefit most from the easterly winds, as the air gets recharged with moisture over the Irish Sea, then rises, cools and condenses over the mountains to bring cloud and often snow. This time, the air wasn’t yet quite cold enough for snow. But the east wind brought an amazing cap cloud over the top of Slieve Bearnagh. 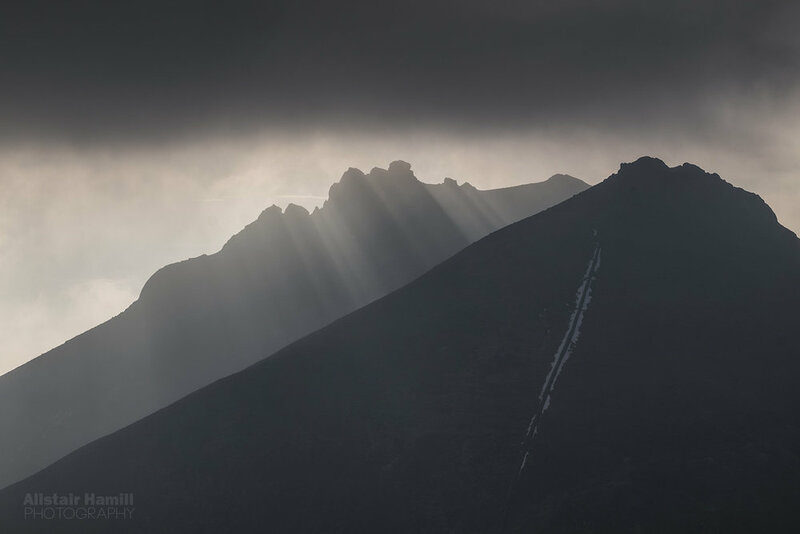 As we hiked up Slievenaglogh, we were treated to the most beautiful of cloud and light patterns. Glorious crepuscular rays of light danced across the top of the mountain all afternoon as the most gentle of soft light draped itself across the mountains in front of us. Detail shot of the summit tors of Bearnagh. The line of the Mourne Wall is traced out by the snow from a previous fall that was yet to melt. The lady of the lake...?? The whole display, courtesy of the east breeze, hung around all afternoon and into the sunset. It meant that our photoshoot was relaxed and unhurried. We were able to wander bewteen Slievenaglogh and Corragh, looking for the best angles and positions to allow us to make the most of this scene. 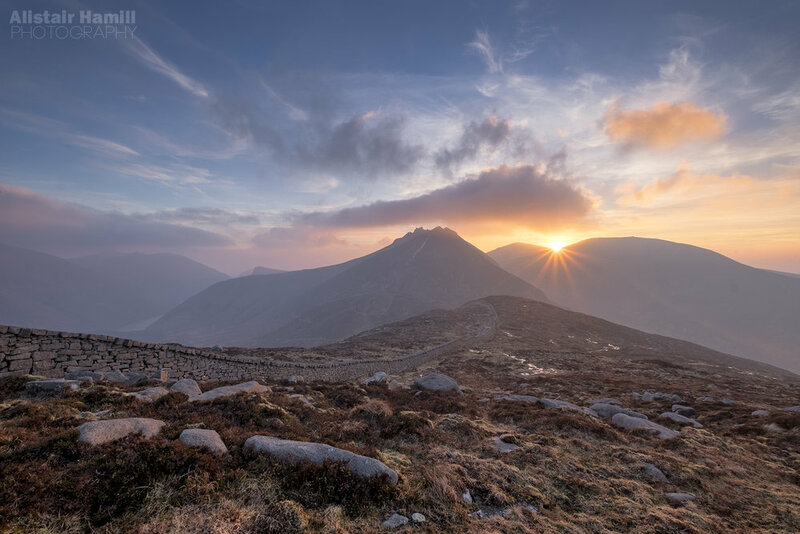 We even had time to jump over to the western side of the Mourne Wall for some shelter as we enjoyed a cup of coffee from the nicest of locations for coffee in the whole of Northern Ireland that day as we watched the most tranquil of sunsets. The sun even managed to settle down for the night in the saddle between Meelmore and Meelbeg, throwing off a little sunburst as a last hurrah in the process. The wind may have been cold; it may have been flexing its muscles, a portent of what was to come. But, for that afternoon, for those moments, seeing the kind of light we have never before witnessed in the mountains, it was the most blessed of breezes indeed. Next time, I’ll talk about what happened when the full blast of the Beast set in.